Part of the romance of Venezia is, of course, the gondola ride. My experience has been that the best time to head out onto the silent Venetian waters in one of these iconic water vessels is around the twilight hour. While the darkness and boat movement do present a photography challenge the point is that by this time of day the cruise shippers have all returned to their boats and the canal jams are virtually non-existent. No hustle. No bustle. Just utter peace and pure Venetian atmosphere as the gondola is gently guided by practiced hands through the small channels and waterways that lace their way through this incredible ancient city. But don’t take my word for it. 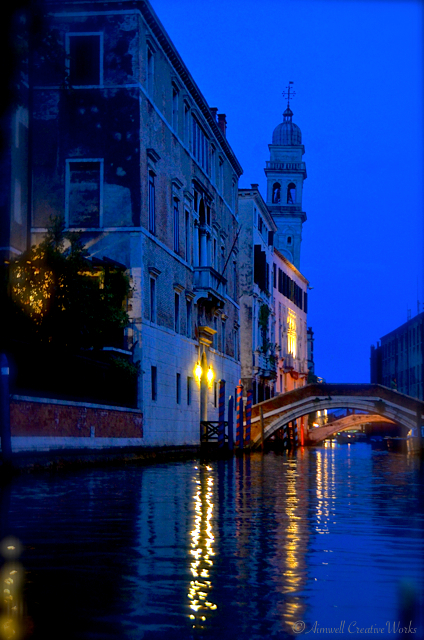 If you’re going to Venizia, save your pennies (gondola rides are expensive, though both times we’ve been split the cost with another couple) and arrange for a magical gondola ride at twilight. This entry was posted in Italy, Photography, Travel and tagged Aimwell CreativeWorks, Dorothy Chiotti, gondola, Italy, Photography, Travel, Venice. Bookmark the permalink.